Yoda said once “Always pass on what you have learned.”. 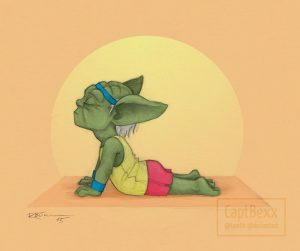 Last week we re-started Yoga classes at school and I tried it 😊, so as Yoda said I will pass on what I learnt!!! First thing you need to know is that is accessible for everyone, you don’t have to be an expert to join these classes at the school, leave the expertise to the wonderful teacher Vaila. Let me tell you that it was a really nice experience, I was interested in Yoga but never done it before so that was the occasion. 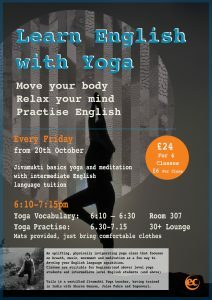 The Yoga experience starts at 6.10 pm with an English lesson about Yoga. So you will learn the vocabulary and the positions 😊!!!!!! After a little quiz to see if you got the parts of the body right and understood what is the pinky 😊, you’re all good to start the practice. Vaila will be here to help you to connect with your body and your inside by the breathing, really good technique to take away tension and stress and starts relaxing your body and your mind. Slowly, slowly you will get through the different positions such as the Mountain 😊 and the Tree!!!!! And still work on your breathing!! You will also learn the salutation to the Sun which is a important part of the Yoga itself. Step by step Vaila will go through the different position on this salutation with you 😊! You will understand how connected are all the parts of your body even the smallest one. You will feel every part of your body lol, it might not feel that good (at first) but no worries it means it works and that your body is receptive. Yoga is a sport, trust me it is not that easy but it does feel good. It is relaxing. I felt really good a few days after the Yoga class and I do know that some students felt good after as well. I highly recommend you to try this Yoga class. It is every Friday from 6.10 pm to 7.15 pm, just come as you are (in comfortable clothes) and the mats will be provided. Interested in joining Yoga class at EC London 30+, check out our website for more info about English learning for adults.